Hey guys! So before I get into the post, lets all pause for a moment, gather some glittery confetti and toss it into the air because I am officially done exams and free from the clutches of school until September!!!! Anyways, today’s topic is matcha! I honestly can’t believe how popular it’s getting! I mean, I’m sure we’ve all had our fair share of green tea frappucinos from Starbucks in the past but the amount of matcha related items popping up is craycray! 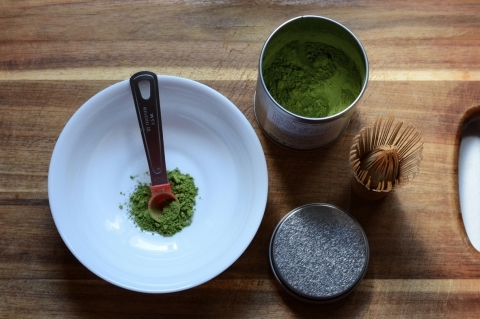 But, I think its kinda ridiculous that the majority of people I know only ingest matcha in one of two general ways: through heavily processed crap (candy, ice cream, etc) or in unnecessarily refined forms (supplements). I mean, why can’t we all just enjoy the real deal?! If you’ve never had a straight cup of matcha before, its super grassy, slightly earthy, and bitter in all the right places with an amazingly smooth finish. It’s far from all that sickeningly sweet stuff you probably know. 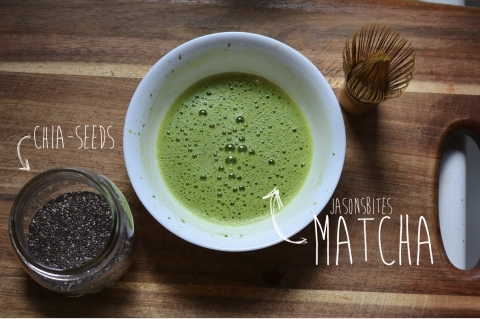 Now if you don’t know about how amazing matcha is for your body, get ready because I’m going to blow your mind. In order to make matcha, the tea pickers (? ), the tea peeps (?) have to individually devein each little leaf before grinding it up into powder. So really, you’re ingesting the entire leaf! Now it might be a bit intimidating at first, because you’re probably all “Um, how the heck am I supposed to make this” and it’s not that difficult! All you need are some handy kitchen tools such as a whisk, a bowl, and some recently boiled water that’s been left to cool for abouttttt 8-10 minutes so that its around 75 degrees Celsius. 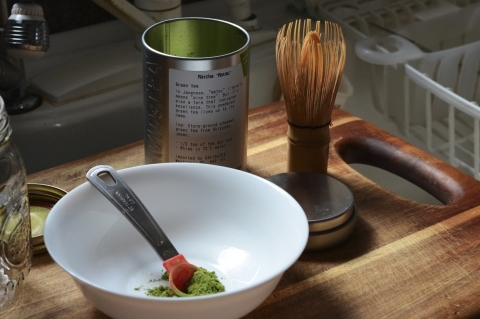 But if you want to invest in some COOL GADGETS that’s gonna make you the best cuppa tea you’ve ever ever had on earth, I got you covered as well 🙂 & yes, having a proper matcha whisk and bowl really make a difference! DAVIDsTEA – the Matcha Essentials! – all the tools you need: the bowl, whisk, and teaspoon! – which is the kind that I use at home! Now if you’re someone who never has much time for breakfast and has to decide between that piece of toast or coffee before dashing out the door and into a hectic day, no worries, I got you COVERED with an even better option. You heard me! It’s an amazingly simple way of making a breakfast (or snack) that will energize you, keep you full, and provide you with the benefits of chia seeds, which is another superfood! So really, it’s like superfood x superfood which basically means you’re ingesting a megafood, right?? But wait – it gets even better! If you need to dash out the door, you can even blend this into a smoothie! Chia seeds are a great thickener and you’ll end up with an awesome, creamy, and fantastic breakfast on the go! What Others Cook For Me: Taiwanese Beef Noodle Soup!